In case anyone was wondering why I’ve not posted any new graveyard photos, I’m happy to report that the current air temperature in my corner of Lovecraft Country has finally dropped below molten lead and I hope to post another soon. Hopefully the stones have not melted. ENies voting time is upon us again. There are a lot of great Lovecraftian books nominated this year; vote now, eh? Arc Dream is having a sale on their One Roll Engine, Fate, and Savage World products in order to raise extra funds in advance of GenCon and NecronomiCon. Let’s give Shane extra cash, eh? First off, a reduced crew from the Miskatonic University Podcast (augmented by guest host Brian Sammons) picks over the bones of their recent discussion of Lovecraftian films and finds a lot more meat than you might expect. Secondly, Paradroid (of the late, lamented ‘Paradroid Papers’ on Yog Radio) has interviewed Golden Goblin Press’ Oscar Rios. The introduction is in German (about 45 seconds) but the remaining 18 minutes is in English and includes some tantalizing details about future GGP books. 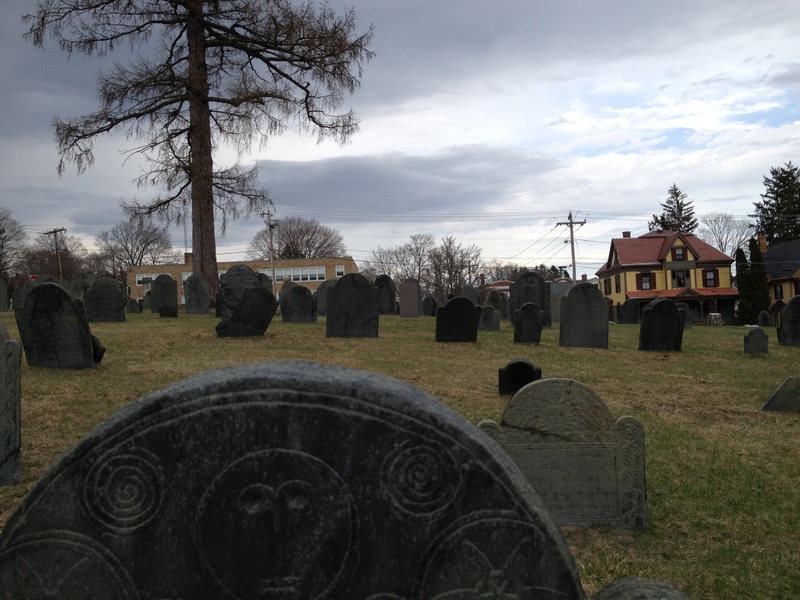 Having some free time, I paid a visit to Auburn Cemetery (aka Auburn Center Burial Ground) in Auburn, MA. Established in 1777 it is the second oldest burial site in Auburn (after the Cudworth Family Burial Ground c. 1750; that graveyard has only a 20th century marker however). There are a nice collection of stones created by William Young as well as an unusual portrait stone by James New. Unfortunately, I arrived while a grounds crew from the city of Auburn was mowing the grass and cleaning the grounds so, even when I wasn’t in their way, many of the stones were coated in grass clippings. Combined with intermittent rainfall coloring the stones meant that the quality of the photos is not very good. There are more stones of interest to photograph but it just wasn’t to be, today at least. I did have a lovely chat with the director of the grounds crew about the cemetery and his hope to find funding to have some repair work done. They do have a grant to repair their Civil War monument in Hillside Cemetery, so perhaps there is hope? I always like to see a cemetery that is well-kept (and to thank the people who care for them). As summer approaches my corner of Lovecraft Country, free time fades like the bloom on my daffodils (what, I can’t talk about Lovecraft, colonial graveyards, AND flowers?). Nevertheless, I wanted to pass on a few items that might be of interest to my small cadre of readers. The gents at 314 Games have let me know that some reviews have come in for Central de Maquineria Jarkov-37 and they are positive… assuming that I passed my R/W Spanish roll (current skill level 4%), of course. Here’s a video review (he’s wearing a Red Army hat) and a text one, where it looks like the book tied for Best CoC product of 2012. ¡Excellente! In Kickstarter news, Golden Goblin Press’ Island of Ignorance has reached it’s funding goal and is creeping upwards while HP Podcraft’s “Live in Providence” project, which reached in initial goals weeks ago, will close up in a little over 40 hours. I kind of hope the later somehow his $8000 so they’ll do an audio production of “The Yellow Wallpaper” but that’s not looking too likely at this point. C’est dommage. The gang at the Miskatonic University Podcast released a new episode… now almost 10 days ago… guest hosted by Brian Sammons who talks about Atomic-Age Cthulhu and House of R’lyeh, among other topics. I’m still at work on the demo issue of the Arkham Gazette. I hope to have it wrapped up by the end of the month, ideally sooner. I’ve had the time to do a few more visits to smaller graveyards and will post about those as life permits. Speaking of graveyards- I finished my map of Franklin County’s graveyards. Check it out. Perhaps I should wrap up with a quick survey of my current Lovecraftian projects? A “Mysterious Manuscript” submission for the Unspeakable Oath. Another article for the Unspeakable Oath. Large, unannounced project of which I cannot speak in slow development. A booklet for Necronomicon of which I shall speak more on later. A scenario and article for a publisher I’ve not worked with before, due by the end of July. Weekly attempts to prod various parties into releasing the Masks of Nyarlathotep Companion at long damn last. A couple of weeks back I had some free time whilst the Homunculus was otherwise engaged to check the remaining graveyards of Marlborough off my list. I had already seen Marlborough’s oldest cemetery, Spring Hill (click for that visit). I can’t speak authoritatively for the commercial viability of the book if it is going to be geared specifically to the CoC community. Certainly there will be interested rpg enthusiasts out there — myself included — but I don’t know if you will recoup your investment of time and capital if that’s important to you. On the other hand, there ARE presses interested in just this “local interest” sort of thing (I can think of Rutgers University’s books on New Jersey history, for example) that might be able to market it to a more generalized audience if you’re willing to go that route. The fact that you’re doing the research, fieldwork and taking photographs might go some way towards engaging a small press that specializes in local history. If it is to be principally a labor of love rather than a commercial venture, I’d say go ahead with it. I, for one, would be a customer. I guess I should clarify. I’m working on two parallel projects, one a visitor’s guide to graveyards (at the present time limited to Worcester County, Mass), the other an RPG project covering graveyards (and funeral practices, gravestones, etc.) focused on Lovecraft Country. The later would literally be a monograph, tightly focused on a single topic in depth, but I would rather hold onto some control of the book rather than sell it to Chaosium for $250. I’m not sure how I’d like to proceed with this project, but I figured I could float a trial balloon here. The other book, the non-RPG one, would hopefully be of interest to local historians. Someone published a similar book for Cape Cod and the Islands in the early 1980s; hopefully a similar project would be of some interest.